Good Morning on this absolutely beautiful Spring morning, its supposed to be 20 degrees in Tassie today, Lets hope it gets there. I am longing for some warm weather. Its been quite a week for me, the postman has delivered me lots of wonderful packages from near and afar. Through my blog I have met the most amazing people, And I'm happy to say we have become very good friends. Last year I became friends with Janita. She is the loveliest lady, we decided to do a little swap with each other. 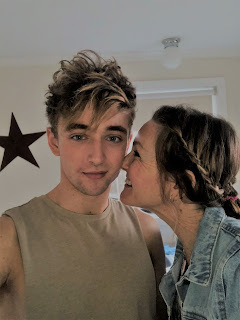 Janita knows how much I love my Americana so she surprised me with the most beautiful gifts, the flag quilt is so special, as its a military flag and as my son has just joined the Military it has a very special meaning. Even he was touched at just how thoughtful this gift is. I love my new pincushion, the colours are perfect and I adore that little flag square in the middle. Thankyou my dear friend for your thoughtfulness, your gifts are beautiful and I will treasure them always. Another special friend is Christine, I received these beautiful gifts made especially for me from Tilda fabric. Christine and I both love Tilda fabric so when we make gifts for each other I think we both have the same idea. Can't go wrong with this fabric is so beautiful. Thankyou Christine, You are such a lovely friend. Another lovely friend sent me this cute mug, now Kim and I have been friends since my cross stitch days, way back about 13 years ago. We met on line and Kim lives in England, she has watched my boys grow from toddlers to teengers. We email each other almost every day, just to say hi and see how each of us is going. Its a very special friendship and even though we have never met in person I feel like I have known her all my life. Yesterday morning I was up early getting the last border on my fig tree quilt, Oh I love how this turned out. Made entirely from my scrap box except the border. Its at the quilters already as I can't wait to get this one finished and use it for Spring. Now I have started a new project, I love it already. I'll be back next week with hopefully lots of progress. I hope the sun is shining wherever you are today. Thanks for stopping by. Beautiful gifts in your mailbox this week. Gorgeous little pincushion.....I love the little squares. 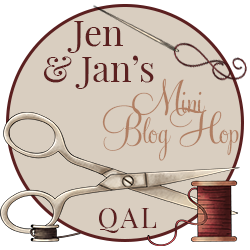 The special friendships that come from craft and blogging are amazing. Beautiful Gifts Leanne - you have been very spoilt! They're all gorgeous gifts Leanne... love the Fig Tree quilt, what a great way to use the small pieces that remain from other projects! Brilliant presents. I agree you meet the nicest people in blogworld. Such beautiful presents for you Leanne. 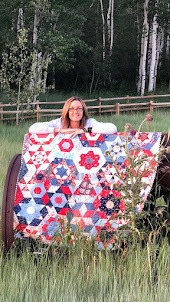 I just love how the American flag and colours are so cohesive with quilting...and at last I know someone close who lives in the USA so I should be able to make one up at some stage. Actually everything is beautiful on your blog post. We just checked and it is 26° here down south of you. It is a gorgeous, gorgeous day! What lovely, thoughtful gifts from your bloggy friends. There are some really nice people out there. Your Figtree Quilt is just so beautiful and I look forward to seeing it quilted. Baskets?! You know they are a favourite of mine. We had 27 degC yesterday and 30 degC is predicted for tomorrow. Yikes! Too hot too soon. What beautiful gifts, the quilt and the pincushion is darling! I love your quilt too, it's amazingly beautiful!